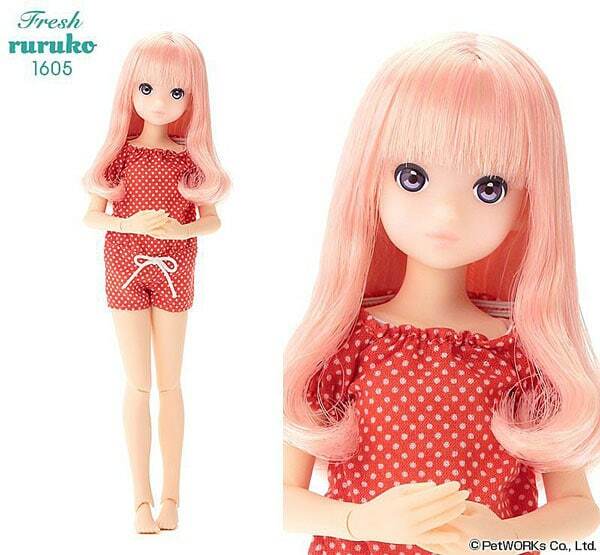 Fresh Ruruko 1605 is one of the cutest Ruruko dolls I've have seen in a very long time. I'm very tempted to make her my very 1st Ruruko. The only thing holding me back is the fact that I planned to get Azone International's Italy & possibly Sahra’s a la mode: Twinkle a la mode Peridot Maya. But honestly I can't see myself passing on Ruruko either. 1. Her Pink Hair - I'm loving her Pale-Blonde/Milky-Strawberry hair color. I'm not sure if this is the first Ruruko with pink hair but it's my 1st time seeing her with Strawberry-Blonde hair and she's wearing the shade so well! 2. Girls with Curls - The lovely curls at the end of Ruruko's hair give her an appearance of sweet innocence. I want to do whatever I can to keep her happy and innocent. 3. Mad Love for the Polka Dots - her polka dot outfit is ultra cute & looks so comfy. Do they make them in adult sizes? We could be twins. 4. She Keeps It K.I.S.S. (keep it simply sweetie) - I'm not usually a fan of PetWORKs' "Fresh" line of Ruruko dolls, they're too plain for my taste but Fresh Ruruko 1605 has it going on and I can now appreciate the The Fresh line's "less is more" philosophy. 5. Can You Say Flexible? - Ruruko has Azone International Pure Neemo Full Flection XS body which means many fun poses and beautiful photo opportunities. What are your thoughts about PetWORKs Fresh Ruruko 1605? Do you plan to add her to your collection or will you skip this release. Are you a fan of PetWORKs Fresh line of dolls or do you wish they add more accessories? I can't wait to chat with you about PetWORK's latest Ruruko.